I am not really much of a reader so I try to keep my book reviews to topics I truly enjoy. When I came across the opportunity to review this book I knew it was for me. 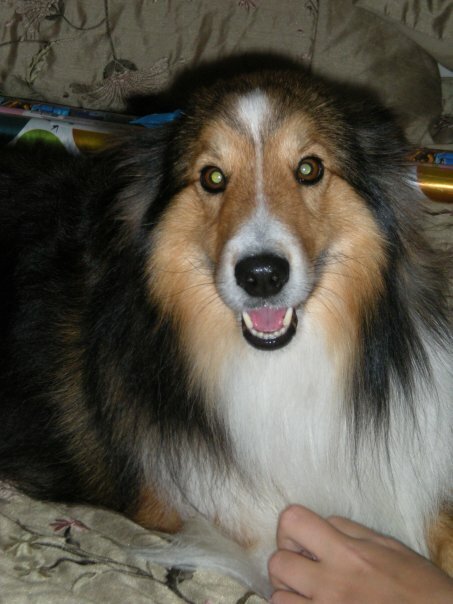 Dog Trots Globe- To Paris & Provence by Sheron Long is the journey of an adorable Shetland Sheepdog to France. I have never talked about my childhood but growing up I had always had a sheltie, and my mother still has several. Growing up a military brat we also got to travel the globe. Of course as a child I never thought about the world through my dogs eyes, so every page of this book brought a smile to my face as I thought back to my beloved childhood friend and what he must have thought on all of our trips and moves. This book was really well written and you can almost feel like you understand what the dog must have had going on in his mind. The pictures are also very vivid and fun, they help to set the scene and of course show us the cute doggy the whole time. I couldn't find a picture of my childhood friend that would scan well, but here is a picture of another one of my four legged friends. His name is sunny and has seen more journeys then I will ever know. I found him about 8 years ago running down the street. He was so poorly cared for and had been out so long he had to be shaved. His biggest journey now is going outback to the potty.lol If you love dogs and are looking for a fun book for the whole family I highly recommend this book to you. If you love dogs or know someone who does I have been given the opportunity to give away one book to one of my fans! Please fill out the rafflecopter options below for your chance to win. That sounds like a fantastic book! Three dogs currently inhabit my house with me - Scooby, Luke and Charlie Machete.